Prions are proteins generally characterized by the ability to exist in two different forms or more precisely two different three-dimensional structures, one of them possibly causing disease when it aggregates. The prion hypothesis, as formulated by Stanley Prusiner, states that this aggregation causes specific neurological diseases such as Bovine Spongiform Encephalopathy (BSE). Even if both the mechanisms of this change of conformation and that of the aggregation are still enigmatic, the prion hypothesis has become a dominant model to which much heuristic power has been attributed in the 1990s. This could be a first paradox. Moreover, whereas three-dimensional structures clearly appear to be at the heart of the matter, Prusiner used mostly biochemical evidence to develop his hypothesis, without using, in the early days, any other graphic representations than that given by electron microscopy. This constitutes the second paradox at the origin of the present paper since only computer representations of three-dimensional structures can explain and justify the prion theory as a model. Here, models are defined as theories with two distinct properties. First, models have an explanatory power more or less confirmed by experimental evidence, which distinguishes them from mere hypotheses. Secondly, models can be applied in domains other than those where they come from. Such application is possible due to the underlying formalism of models, or, as in the prion case, to the diffusion of a specific visualization culture. Since the second half of the 1990s, many scientific journals have published three-dimensional representations of prion structures, always in the non-pathological form (the structure of the other form remaining as yet unknown). What are these representations supposed to bring? Why were they published, sometimes on the cover of prestigious journals? How have they been obtained? The use of computers has of course been decisive but more generally, did the visualization aids provided by bioinformatics help to change the epistemological status of the prion hypothesis? To tackle these questions, we will first outline the context in which three-dimensional structures of proteins, historically called ‘tertiary structures’, have become an important scientific topic. We will then review the place of graphic representations in Prusiner’s work, and show how the prion hypothesis has changed metaphors in biology. This will allow us to concentrate on the conformational change, and to end our narrative with an analysis of the main on-going projects on the tertiary structure, with particular emphasis on the case of ‘yeast prions’. Until fairly recently, historians and philosophers of science paid scant attention to the issue of visual representation in science. Since the mid-1980s, scholars in science studies have become increasingly concerned with the role of visualization and visual representation in the development and practice of science. From this literature has come the clear conclusion that visual representation is far from an epiphenomenon of scientific practice, but rather one of its intrinsic elements. The issue of visual representation can be understood not only in terms of techniques and technology but also in terms of the various practices and activities associated with making ‘natural’ objects observable and intelligible. Ethnographic studies of laboratory activities have been particularly instructive in that regard, showing the transformation over time of research objects and their gradual shaping into pictorial data and graphic displays. The present paper deals with visualization in molecular biology. The recent completion of the Human Genome Project in 2001 has brought disappointment for all those who believed it would lead to rapid progress in gene therapy or at least provide a better understanding of protein synthesis. This worldwide project has produced the complete sequence of human DNA. As is well known, this DNA sequence codes for the amino acids that constitute proteins. The ‘primary structure’ of proteins is given by this sequence of amino acids, and the assembly of some regular structure, such as alpha helices and beta sheets, defines the ‘secondary structure’. If these structures can be defined without complex graphic representations, the full ‘tertiary structure’ of proteins, their functional three-dimensional shape, cannot be easily described in its full complexity without visualization devices since the secondary structure only gives hints to the arrangement of the tertiary structure (only parts that are identified as helices etc.). The problem of ‘protein folding’ corresponds to the process during which the protein acquires its tertiary structure. Even if he insisted at the beginning of his talk on the fact that, as in the case of enzymes, proteins owe their specificity and activity to the properties of their tertiary structure, Crick dealt mostly with ‘information’, which he defined as “determination of sequence, either of bases in the nucleic acid or of amino acid residues in the protein”. He developed his views under the hypothesis that “folding is simply a function of the order of the amino acids” and the conference became famous because of the formulation of what he called “the Central dogma” of molecular biology. As he wrote, “This states that once ‘information’ has passed into proteins it cannot get out again”, which means that information cannot flow from proteins to genes (Crick is somewhat vague about the role of RNA which determines the sequence of amino acids). Crick later explained that he meant ‘axiom’ rather than ‘dogma’ but the diffusion of this idea led many researchers to consider the analysis of DNA as a quest for the Holy Grail. Under the assumption that DNA sequences would explain protein synthesis, most funding went to genetics and protein studies became somewhat neglected. A static conception of protein dominated, whereas biochemists knew that the study of the folding process requires a dynamic approach. Molecular biology has been developed in a civilization based on writing. Scientists publish articles and even when they talk, they say that they present ‘papers’. How did they acquire and transmit their knowledge regarding protein tertiary structures? To understand the structure of molecules, biologists managed – often with the aid of X-ray analysis – to build physical models of the molecule they wanted to study. Robert Corey and Linus Pauling, who offered tools to identify secondary structures, designed various types of models. Some of these models emphasised the volumes occupied by atoms in the molecules and afforded an understanding of steric hindrance. The Corey-Pauling-Koltun (CPK) space-filling models, based on an original design by Corey and Pauling, became very popular in the late 1960s (Francoeur 2001). These physical models did not allow for satisfactory manipulation and their construction often proved physically impossible for big molecules (some biologists even contemplated building models under water to avoid the effect of gravity). The breakthrough came with the development of time-shared mainframe computers, which allowed real-time functioning and interactivity between the user and the machine. The precise origin of the concept and techniques of interactive molecular graphics can be traced back to a group of scientists around the molecular biologist Cyrus Levinthal (1922-1990), active at the MIT in the mid-1960s (Francoeur & Segal 2004). Interactivity was the key element of his visualization device called the ‘Kluge’. It referred to the relative ease with which the scientist was able to transform the display to highlight particular features of the displayed object or modify specific parameters of a simulation and get a fast or immediate visual feedback. In short, this interactivity implied a capacity to experiment and tinker with the data being modelled or the phenomenon being simulated. Skilled scientists learned to see what was being disclosed and in this sense, interactive molecular graphics became a way of revealing the inner character or hidden nature of things. Because the Kluge was a vector-based display, only the bonds between the atoms could be represented, recreating the visual experience of skeletal models, without the problems of gravity. The illusion of three-dimensionality was created by rotating the structure on the screen and having the user control the rate of rotation through the “track-ball”. A light-pen and buttons were also used to interact with the displayed structure. In the 1960s, the use of computers by Levinthal’s team did not lead to important scientific success. For example, the structure of cytochrome-c he proposed was not the same as the one obtained with classical methods of crystallography. However, in a long-range historical analysis, it appears that this work deeply changed the work of biologists interested in the tertiary structure of proteins. At this point, biochemistry met computer science and some of Levinthal’s collaborators like Martin Zwick remember that they were quite happy to leave “wet chemistry in favor of computation”. On a sociological level, a new community was born around objects that were no longer real, but digital representations of molecular structures. Most of Levinthal’s co-workers helped promote interactive molecular graphics and alongside the expressions in vivo and in vitro which already characterized biological studies, a new approach was introduced: in silico. Many different programmes and visualization devices were developed between the 1960s and the early 1980s when Prusiner introduced the prion hypothesis. In the mid-1970s for instance, a first protein structure was solved by means of crystallography and visualized entirely with computers (without building a physical model). The scope of this paper does not allow us to comment on the place of visualization in all the different works on protein structure. The important characteristic of the history of molecular visualization is that a co-evolution exists between the state of the knowledge and the representation of structures. For example, when the relevance of describing secondary structures with alpha helices and beta sheets was admitted, schematic conventions to represent these structural elements were adopted. In this sense, we will try to show in the following sections how representation determines current knowledge related to prions, keeping in mind that specific modes of visualization “frame” the thinking about the object they represent. Time has now come to look at how prions have been represented, bearing in mind that representations are a product of scientific activity and also influence the way science is being done. Our aim is to see how these representations affect prions as epistemic things, which at the same time result from investigations and steer their course, until they finally settle into well-defined concepts. In his 1982 publication in Science, Stanley Prusiner introduced the word ‘prion’ to denote “small proteinaceous infectious particles”. The methods he used belonged to a large extent to biochemistry and also to virology for the study of infectious properties (Prusiner 1982). The major question concerned the way in which prions “replicate”, if they are devoid of nucleic acids. An “interesting analogy” was made with retroviruses (where in a schematic way, information flows from RNA to DNA), and also with the “auto catalytic” property of the tobacco mosaic virus. For the most part, Prusiner’s theory was based on the long observation of diseases like scrapie, kuru and Creutzfeldt-Jakob disease (CJD). Determining the molecular structure of prions was only considered as a means to gain better understanding of the aetiology of these diseases: “A knowledge of the molecular structure of prions may help identify the aetiology of some chronic degenerative diseases of humans.” (Prusiner 1982: 143). At that time, the idea that a molecule could exist in two conformations, one of them being able to aggregate, was not mentioned. This text is worth quoting entirely since it raises the question of the nature of the observable: it is not prions that are directly observed but only antibodies, which have the specific property of reacting with prions. The antibodies used in the preparation were labelled with an enzyme (peroxidase) which, as Prusiner explained, “catalyses the conversion of a colourless reagent into a dark stain.” (Prusiner 1984: 49). The micrographs showed these stained structures which were actually not ‘prions’. Electronic microscopy was used to show what was thought to be “aggregations of prion ‘rods’”, described as “tufts with a fluffy texture”. These rods were supposed to be “a condensation of perhaps 1,000 PrP molecules” and the fact that they were indirectly represented (with specific antibodies) helped to stabilize the theoretical existence of prions as infectious agents devoid of nucleic acids. Thanks to these micrographs, the main issue could shift from the search for nucleic acids to the structural study of these rods, which were noticed to “closely resemble amyloid plaques”, specific to diseases such as Alzheimer’s. A scientific culture related to visualization devices then emerged not only in Prusiner’s prion research but more generally in the TSE field. As shown by Seguin (this volume), many of Prusiner’s papers were published in journals traditionally devoted to neurodegenerative diseases: Neurology, Annals of Neurology, Journal of Neuropathology and Experimental Neurology, or Acta Neuropathologica. It was in this latter journal that Prusiner published in 1987 a review article in which he specified the infectious part of PrP (PrP27-30), and concluded that “the conformational differences between PrPc [the ‘cellular’ protein, nonpathological] and PrPsc [the protein that causes sheep scrapie] are unknown but probably arise from post-translational modifications” (Prusiner et al. 1987: 299). In this paper, prion rods were shown on three different scales. These illustrations were much more detailed, and their composition was also given: rods are aggregates of PrP27-30. 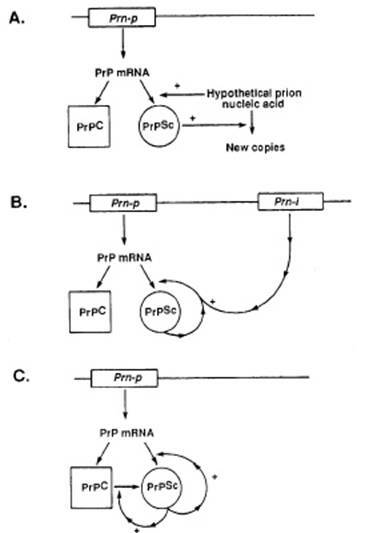 The caption indicated that this diagram illustrates “three possible models of prion multiplication” (to be compared with the four models of another 1988 paper from the Prusiner group, figure 3 of Poulsen & Andersen paper in this volume, which also represent genes and enzymes). The word ‘multiplication’ instead of ‘reproduction’ or ‘replication’ previously used, clearly showed that the first hypothesis was given less and less credit. Poulsen & Andersen showed how another diagram published in 1991 helped Prusiner illustrating his theory (Figure 1 of their chapter in this volume). The secondary structure of PrP was proposed by Prusiner and his team in 1992, based on biochemical models (Gasset et al. 1992). Prusiner and colleagues used synthetic peptides reproducing the four parts of PrP in which they hypothesized the existence of a-helical regions. Three out of the four synthetic peptides formed amyloid plaques composed largely of b-sheets. Hence, Prusiner and co-workers came to the idea that the putative conformational change between PrPc and PrPsc was due to a change of a-helices into b-sheets. One may wonder about the relevance of reproducing these micrographs. Were they regarded as visual proof that PrPc contained three or four helices that could change into b-sheets in PrPsc? Since they did not demonstrate it, one could argue that they actually weakened this theory. On the other hand, Prusiner’s prediction of the secondary structure of PrPc shifted the debate away from the notion that PrPc could replicate without nucleic acid. Scientists then started to focus on this prediction, and some disputed it. In 1992, a specialist in computational biology, Fred E. Cohen, had joined Prusiner’s team. In 1994, two years after the publication of the predicted a-helical regions, they proposed a three-dimensional structure of PrPc (Huang et al. 1994). In this paper, the PrP used was common to different species. We read that “PrP amino acid sequences from 1 avian and 11 mammalian sources including chicken, cow, sheep, rat, mouse, hamster, mink and human were used.” (Huang et al. 1994: 7139). Prusiner and colleagues’ prediction of the three-dimensional structure of this PrPc was presented as a result of computational studies and for the first time ‘computer modelling’ featured in the keywords. 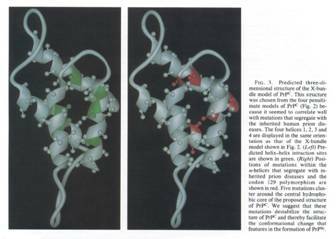 Following up the 1992 paper, the researchers tried to explain the stable tertiary structure of PrPc. The transition from the secondary to the tertiary structure was made by “exploiting recent advances in protein structure prediction algorithms” in order to obtain a three-dimensional structure of PrPc “based on a family of homologous amino acid sequences.” (Huang et al. 1994: 7139). This notion of homology depended on the constitution of databases like ExPASy (Expert Protein Analysis System) at the Swiss Institute of Bioinformatics whose Internet server had just been opened (1 August 1993). When the 1994 paper was published structure predictions were being tested and compared to crystallographic and Nuclear Magnetic Resonance (NMR) studies. In December 1994 the first meeting on Critical Assessment of techniques for protein Structure Prediction (CASP) was organized in Asilomar. The idea was to organize a contest between computer models, differentiating three topics: ‘comparative modelling’, ‘fold recognition or threading’, and ‘ab initio folding’. Fred Cohen, co-author of the 1994 paper, was in charge of the last topic (Huang et al. 1994). Among four possible topological arrangements an X-bundle structure was chosen based on minimal distances between helices, even though the authors explained that the algorithms they had used to predict the secondary structure were probably not appropriate for a protein that exists in two conformational isoforms. In this Figure, we see the same structure twice but with different indications. On the left-hand side, the predicted helices interaction sites are highlighted, whereas on the right-hand side, we see the mutation points that were supposed to explain genetically the difference between PrPc and PrPsc. This figure was used as a means to understand how the conformational change could take place. The caption stated: “we suggest that these mutations destabilize the structure of PrPc and thereby facilitate the conformational change that features in the formation of PrPsc (Huang et al. 1994: 7142). In a review article also published in 1994, the prion was no longer presented as a hypothesis but rather as a “concept” (Prusiner 1994). The section “development of the prion concept” was placed just before the section on the discovery of the prion protein and Prusiner was proud to announce that “after a decade of severe criticism and serious doubt, the prion concept is now enjoying considerable acceptance.” (Prusiner 1994: 658). Figure 9 introduced spatiality to gain a better understanding of prion structure and compared to Figures 2 and 4 above, marked a transition in the epistemological function of representations. As the original caption of the stereo views indicated, these graphic representations displayed information that could not be conveyed in textual format. Such tangling up of alpha helices and beta sheets was too complex to be described and scientists had to be trained to decipher stereo views. The analysis of the proposed three-dimensional structure (Parts ‘D’ and ‘E’ of Figure 10) correlated with a study of PrPc in different species led to the formulation of the ‘protein X’ hypothesis, which would be species-specific and act as a molecular chaperone in PrPSc formation. This demonstrates that graphic representations can play an active role in scientific work since they can lead to new hypotheses and models. In October 1997, Prusiner was awarded the Nobel Prize for physiology or medicine. He was awarded alone (which had not happened for 10 years) and his theory was not yet proven. This gave rise to criticism as shown by Kim (this volume). The fact remains that on the sociological level the effect of the award was to reinforce the validity of the prion concept. In his Nobel lecture, Prusiner used the pictures of a modelled three-dimensional structure displayed above and these images benefited from widespread exposure (Prusiner 1998). The three-dimensional structure of PrPc was used to convey information aimed at explaining the conformational change in its dynamical aspects. It is usually difficult to represent in one’s mind the flexibility of proteins. In the last five decades, structures have been extensively represented, whereas dynamical properties were neglected. Though in the early 1960s Levinthal and colleagues produced films, these were not widely diffused. As a result, when seeing a protein researchers used to think only in terms of structure. In contrast, thanks to the use of different colours, Figure 11 represents the ability to move, that is, readers can imagine the movements of the different parts of PrPc. In this sense, from the adoption of the dynamic approach, diagrams shaped the reader’s mind. This exemplifies how representations of prions have become epistemic things: diagrams are presented as the outcome of research but they also influence the way researchers define their object. This brief review has shown that in order to develop and foster the prion hypothesis, Prusiner increasingly resorted to a range of visual devices, from micrographs of prion rods to computer modelling of PrP. Colourful graphic representations generated by computer have featured on the cover of a number of journals and in this way, the prion hypothesis became so popular that it could serve as a model. In particular, computer modelling enabled precise representations that permitted to get a better insight into the conformational change. In the following section we will see that the progressive diffusion of this kind of work has changed the way biologists interested in protein studies and TSEs use metaphors. Metaphors have different statuses in science. If some of them are recognized as such, others derive from the development of predominant scientific discourses and are used somewhat unconsciously. The development of the prion hypothesis and the popularisation of related representations provide a unique opportunity to analyse a shift in the use of metaphors in molecular biology. The ‘informational metaphor’ has been progressively replaced by other, more concrete, metaphors like the ‘domino-stone’. Traditionally the explanation of the process of infection has been dominated by a discourse based on information theory. Information theory derived from the mathematical theory of communication and from cybernetics, and had applications in many different fields. This development was concomitant with the discovery of the DNA structure. In the lapse of time between the publication of Crick and Watson’s paper (1953) on the double helix and the identification of the genetic code (1961), information theory deeply influenced discourse production in molecular biology. Kay (2000) has shown that even though on the scientific level information theory has been of little help, it has nevertheless generated important informational metaphors. Genetic ‘information’ was at the core of a number of studies. The discovery of retroviruses in the early seventies (for which Howard Temin received the 1975 Nobel Prize) did not really change this conceptualisation since scientists were still speaking of an information flow, though from RNA to DNA. In academic journals devoted to the history of science, only one article has been published on prion history, which explores the challenge of the ‘central dogma’ of molecular biology by the prion hypothesis (Keyes 1999). However interesting it may be, the discussion is rooted in a misunderstanding of the notion of information in biology. Keyes seems unaware of the metaphoric nature of the notion of information. Thus, in addition to the classical “sequential information” she proposes the concept of “conformational information”: “a possible new method of replication achieved via the transfer of conformational information forced a reassessment of the elements of molecular biology’s theoretical framework.” (Keyes 1999: 4). Unsurprisingly, she also defines the prion as an “information molecule” and grants it with an “informational role” (Keyes 1999: 210). In stark contrast, other authors, mostly scientists, found in the prion theory an opportunity to get rid of this information metaphor and chose to illustrate their point of view with graphic metaphors that differ from the traditional arrows illustrating information flows. As it became clear that thinking in terms of genetic information was not relevant to the understanding of prion diseases, other metaphors were developed to explain the spread of PrPsc. In 1996, Adriano Aguzzi at the Institute of Neuropathology (Zurich University Hospital), and Charles Weissmann at the Institute of Molecular Biology (University of Zurich), worked on PrPc and showed that this molecule was required for infection by PrPsc. Studying the “propagation of the infectious agent”, they gave up the information metaphor and introduced the ‘domino-stone’ metaphor: “Within the framework of the protein-only hypothesis, these findings [the fact that PrPc is required for the spread of scrapie] may be accommodated by a ‘domino-stone’ model in which spreading of scrapie prions in the CNS [central nervous system] occurs per continuitatem through conversion of PrPc by adjacent PrPsc.” (Brandner et al. 1996: 13151). This shift was so important to them that they made a ‘model’ out of it, which has been extensively used by Aguzzi’s team to study the conversion of PrPc into PrPsc. In a paper published in 2000, the domino model illustrated neuroinvasion in the peripheral neural system. The authors put forward that there could exist “a mode of transport in which PrPc localized on the PNS is converted into PrPSc in a ‘domino’ fashion centripetally towards the CNS.” (Glatzel and Aguzzi 2000: 2820), and then referred to their 1996 paper. The progressive acceptance of the prion hypothesis was accompanied by other metaphors of graphic inspiration. In textbooks or tutorials the “rotten apple” metaphor is used to illustrate how a property can spread without information flow. For instance, on a website devoted to BSE one finds this statement: “Like a rotten apple, once inside the brain, the mutant form of prion protein turns the native protein into more copies of the deviant, infectious form”. Work on the conformational change and the three-dimensional structure of prions led to a shift from the informational metaphor to these more graphic metaphors. In turn, the emergence of these new metaphors has contributed to further stimulate the search for the three-dimensional structure. As a result, since the mid-1990s knowledge of the three-dimensional structure has become a holy grail, and not only in Prusiner’s work. As we will see below, many researchers have now joined this race and different approaches have been devised. Over the years Prusiner’s prion theory gained widespread acceptance and computer technology soon was at the forefront of protein studies. Yet, if Prusiner’s work has been decisive in establishing the prion theory, his papers on prion structure (mostly on the secondary structure) have not been regarded as seminal. Prusiner became only one contestant among others in the race to determine the three-dimensional structure of PrP. In the opening speech of an international conference titled “postgenomics”, held in July 1998 at the Max Planck Institute for the History of Science, its director H.-J. Rheinberger stressed that “instead of being theory-driven, [molecular biology] appears to be eminently technology-driven”. This statement clearly applies to research on the structure of prions, where two main techniques have been used, namely, crystallography (see part II) and NMR. Until the mid-1980s, the main approach to solve three-dimensional protein structure was through X-ray diffraction analysis, which makes use of crystallized proteins. Studies by John Kendrew and Max Perutz in the late 1950s, respectively on myoglobin and haemoglobin, were emblematic of the crystallographic approach. About ten years before, Felix Bloch and Edward Purcell had come up with the principle of NMR, which allows the detection of subatomic and structural information of molecules. In NMR a strong magnetic field (the stronger the field the higher the resolution) is applied to a sample and measures of how the system responds to radio waves are taken. Initially NMR helped in chemistry to analyse quantitative mixtures containing known compounds. It took a long time for it to be applied to biological molecules. This was regarded as visual confirmation that NMR was indeed of interest in molecular biology. In addition, NMR was a kind of complement to crystallography. Whereas crystallography supposed a fixed structure, NMR structure investigations were made in solution. Wüthrich eventually received the 2002 Nobel Prize for Chemistry, “for his development of nuclear magnetic resonance spectroscopy for determining the three-dimensional structure of biological macromolecules in solution”. Crucially, a comparison with the mutation points identified in the primary structure of human PrP supported the proposed structure. From that time on NMR has been widely used in the study of prions and we have seen that Prusiner has also used it. In a short history article published in 2001, Wüthrich confidently claimed: “we may soon be able to obtain information on the structure of the disease-related, aggregated form of the prion protein” (Wüthrich 2001: 925). An important aspect of the 1996 paper on the structure of the mouse prion (Riek et al. 1996) was the use of bioinformatics. In the box where ‘methods’ were described, we read that “the program Molmol was used to generate the figure.” The authors referred to a previous publication in the Journal of Molecular Graphics that described Molmol as a visualization device “with special emphasis on nuclear magnetic resonance (NMR) solution structures of proteins” (Koradi et al. 1996: 51). The classical approach of biochemistry had thus been complemented by structural biology, with its emphasis on 3D molecular structure. In 1997, Wüthrich also used Molmol to design a monoclonal antibody that could be used to establish diagnosis (Corth et al. 1997). Three years later, in 2000, Molmol helped to visualize the human prion structure obtained by NMR (Zahn et al. 2000). A technical culture specific to computational biology is embodied in all software designed to represent structures. Progressively, this blurs the distinction between crystallographic and NMR methods: attention is paid to the structure provided by visualization devices irrespective of its mode of production. Moreover, whereas crystallography was dominant in the static approach, researchers have now started to use it for the identification of mobile parts of molecules. Though scientists still belong to one or the other scientific culture, this further blurs the difference between the two techniques. Today, an image of the three-dimensional structure of human PrPc stands on its own, with no caption, on Wüthrich’s homepages. The knowledge of PrP structure led to reification and just as the double helix stands for DNA, the structure of PrPc now stands for the prion. IV-2. Salvation in the ‘yeast prion’? In the same way as the bacterium Eschirechia coli served as the typical prokaryote organism (organism without nucleus) for the development of early molecular biology in the 1940s, the yeast Saccharomyces cerevisiae has now become a useful organism for the development of a prion model. Yeast reproduces within a few hours and is thus much easier to handle than mammalian prions. Scientists assume that the understanding of the conformational change in yeast will provide valuable insight for studying mammalian PrP. Since the mid-1980s a journal called Yeast has been devoted to these microorganisms. The Yeast editor for North America, Reed B. Wickner, whose background is in genetics, works at the National Institutes of Health. In 1994, drawing upon studies conducted in the early 1970s by Cox and Lacroute, Wickner was the first researcher to see in yeast an analogue to mammalian prions defined as infectious proteins. In an article published in Science, Wickner identified a “prion analog”, a protein that was found in two forms [Ure2], and [Ure3] for the altered form. Wickner wrote in the abstract: “In analogy to mammalian prions, [URE3] may be an altered form of Ure2p that is inactive for its normal function but can convert normal Ure2p to the altered form.” (Wickner 1994: 566). Through the use of this analogy the prion concept came to be considered as a model rather than as a hypothesis. The structure of yeast was studied in order to find “prion-inducing domains” (Masison and Wickner 1995). In a review article published in Yeast in 1995, Wickner (Wickner et al. 1995) explained that two yeast prions had been identified: [URE 3] and [PSI+], the altered form of the protein Sup35. The main work on [PSI+] was accomplished by Susan Lindquist, a specialist in heat-shock proteins (HSP, proteins produced when cells are exposed to warm temperatures, to ethanol, and other forms of environmental stress) (Chernoff et al. 1995). The concentration of a HSP named HSP104 determines whether Sup35 is ‘cellular’ or ‘resistant’, to use the notation introduced by Prusiner for mammalian prions. Molecules like HSP, which can influence protein folding, are called ‘chaperones’, the theory of which was introduced in the mid-1980s. Following the path breaking work of Wickner and Lindquist, other scholars decided to work on yeast prions. One incentive was that security standards for yeast studies are not as high as those required for work on mammalian prions. Young researchers like Ronald Melki and his team at the ‘Laboratoire d’enzymologie et de chimie structurales (Centre National de la Recherche Scientifique), took advantage of this aspect. They decided to work on Ure2 gene products, expressed in E. Coli. 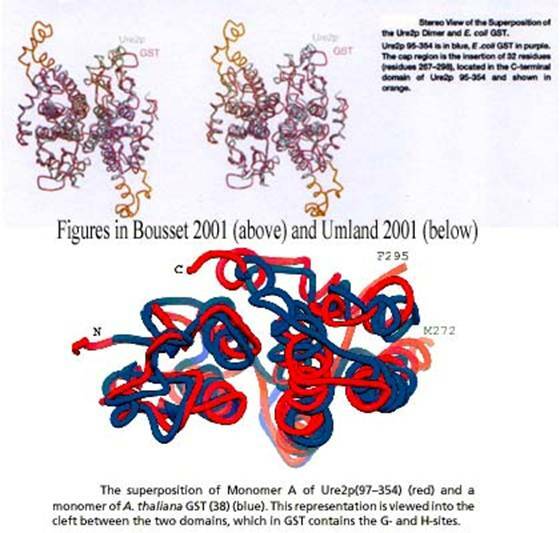 A geneticist working on the same site at Gif-sur-Yvette (France), Christophe Cullin, gave them the gene coding for Ure2p, and in 1999 this collaboration resulted in the publication of an important article in the Journal of Biological Chemistry (Thual et al. 1999). The authors characterized by biochemical methods Ure2p self-assembly in a dimeric state and gave “strong evidence for the existence of at least two structural domains in Ure2p molecules” (Thual et al. 1999: 13666). They concluded their paper with a comparison with other “prion-like” proteins. In order to deepen the analysis of the three-dimensional structure, Melki and co-workers tried to crystallize Ure2, which had been purified to homogeneity. Since the characteristics of the beam line of the synchrotron they had access to were incompatible with the size of their crystals, they used the European Synchrotron Radiation Facility in Grenoble. Their results were published in 2001 (Bousset et al. 2001). This was the first crystal structure (as opposed to ‘NMR structure’) of a protein with prion properties. A month later Wickner and colleagues also published a structure of Ure2 (Umland et al. 2001), though less complete than Melki’s. 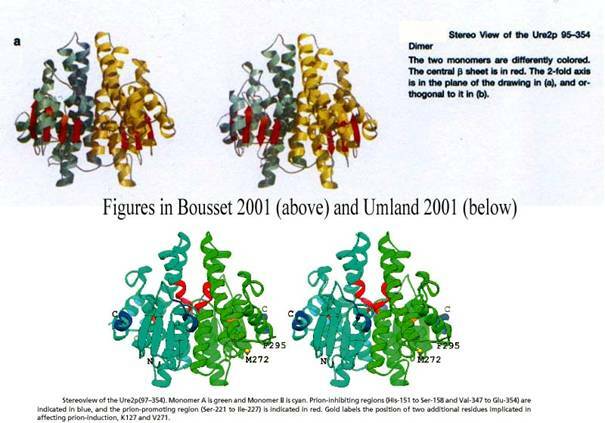 Many graphic representations were given in both papers: stereo views of electron density maps, ribbon representations, and also comparison with already known structures like a bacterial glutathione S-transferases (GST). Crucially, both Melki and Wickner used the phrase “prion protein” in the title of their papers, instead of “prion-like” in Melki’s 1999 paper (Thual et al. 1999). This figure represented three dimers and the caption explained that this “should help us to understand the mechanism of the amyloid formation associated with a number of degenerative diseases.” The underlying motivation of the race to the tertiary structure is to design drugs that can interfere with the structure to avoid aggregation. In this sense, graphic representations not only contributed to turning the prion hypothesis into a model, they also have a real heuristic power that should soon be appreciated. This being said, if research on [URE 3] and [PSI+] in Saccharomyces cerevisiae has become paradigmatic of the prion model, some important considerations are sometimes missing from the modelisation procedures. To begin with, no pathogenic effect has ever been noticed in yeast. One of the two phenotypes that have been studied presents interesting aggregation properties similar to that of PrPsc but does not cause disease. If Ure2p can aggregate in vitro, it has now been proven that it does not cause [URE3] in vivo. Moreover, no homology sequence has been found between mammalian and yeast prions. To encapsulate these differences with mammalian prions, the term ‘propagon’ has recently been proposed to designate yeast prions. “A scientific concept which is not supported by direct visualization is always difficult to establish, whatever its origin may be. In biology (I don’t speak about physics or mathematics), something you cannot visualize always poses a lot of problems”. Yet, with the later work of Prusiner, Wüthrich, Wickner and Melki on prion structures, representations progressively became the core of the prion theory. In a recent paper on the “structure and assembly properties of the yeast prion Ure2”, the word ‘picture’ has acquired a new meaning. The authors write that they hope to get a “full picture of the molecular events at the origin of prion propagation” (Bousset et al. 2002: 6). Thanks to computer graphics allied to NMR or, in this case, crystallography, the epistemological function of visualization has moved from a mere illustration to a possible explanation of the very nature of prions. Visualization has played an important role in changing the status of the prion concept from hypothesis to model. If biochemical experiments are still paramount, computer graphics have been essential to determine the three-dimensional structure of PrPc and are likely to play a similar role in determining the structure of PrPsc. The development of therapeutics will conclusively establish the importance of three-dimensional structures since drug design aims at producing a molecule that can interfere with the structure of the pathological protein. More generally, now that the Human Genome Project has been completed, there is little doubt that protein studies will continue to greatly benefit from the development of the prion hypothesis and its visualization culture. Baldwin, M.A. et al. 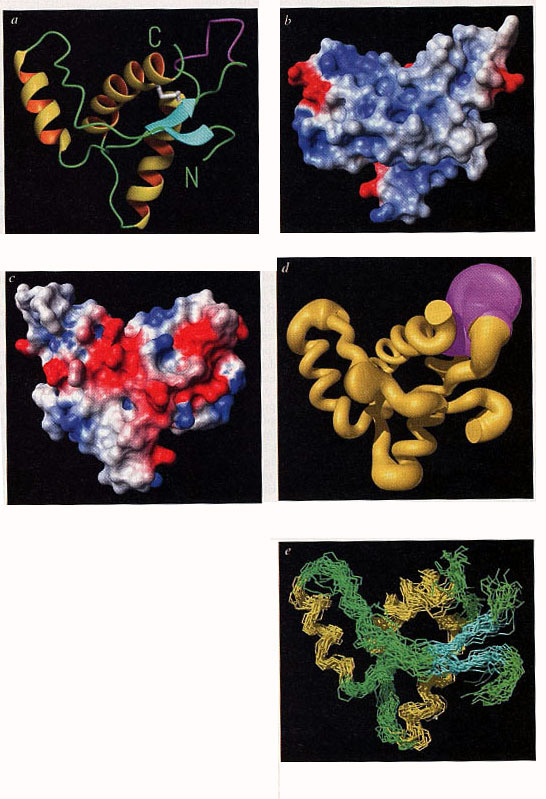 (1998), “The three-dimensional structure of prion protein: implications for prion disease”, Biochemical Society Transactions 26: 481-486. Chernoff, Y.O. et al. 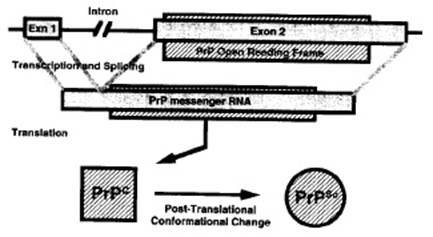 (1995), “Role of the chaperone protein Hsp104 in propagation of the yeast prion-like factor [psi+]”, Science 268(5212): 880-884. 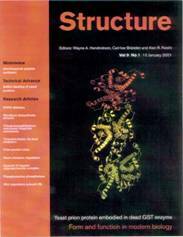 Francoeur, Eric (2001), “Molecular Models and the Articulation of Structural Constraints in Chemistry”, in U. Klein (Ed.) Tools and Modes of Representation in the Laboratory Sciences, Dordrecht, Kluwer Academic Publishers: 95-115. Merz, Patricia et al. 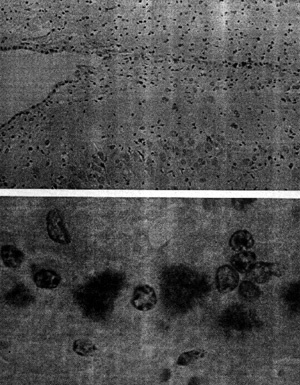 (1984) “Infection-Specific Particle from the Unconventional Slow Virus Diseases”, Science 225: 437-440. Morange, Michel (1998), A History of Molecular Biology, Cambridge, Harvard University Press. Soojung-Kim Pang, Alex (1997), "Visual Representation and Post-Contructivist History of Science," Historical Studies in the Physical and Biological Sciences 28: 139-71. The reluctance of philosophers and historians of science to pay attention to the visual aspects of scientific practice has already been discussed (Rudwick 1976; Griesemer 1991). Thomas Kuhn, for example, considered that visual representations were ‘at best by-products of scientific activity’ (Kuhn 1977: 350). For the most recent reviews of the science studies literature on visualization and visual representation, see Cambrosio (2000), Lynch (1998) and Soojung-Kim Pang (1997). Latour and Woolgar (1979), Latour (1993), Amann and Knorr Cetina (1990), and Lynch (1985). An extensive literature deals with Crick’s article. See Sarkar (1996) and Morange (1998). For a rapid overview, see Levinthal (1966). Parallel to Levinthal’s work, a ‘Oak Ridge Thermal Ellipsoid Program’ (ORTEP) was also developed by Carroll Johnson (1965) to represent molecular structures using plot printers. Crystallography is the X-Ray analysis of the structure of crystallized proteins. This work was achieved by David and Jane Richardson and colleagues, using a density-fitting computer system called ‘GRIP’ at the University of North Carolina. For an overview of the history of interactive molecular graphics, see Martz & Francoeur (2001). On the notion of epistemic thing, see Rheinberger (1997). See on this subject Kim’s paper on “Styles of scientific practice” in this volume. This review article is largely based on a paper published in Cell (Prusiner 1983). In 1981, Patricia Merz at the Institute for Basic Research in Developmental Disabilities had already discovered that molecules in the central nervous system could have disease-related structures (Merz et al. 1981). She used electronic microscopy to isolate what she called ‘scrapie-associated fibrils’ (SAF), supposed to be pathogenic and similar to the ‘rods’ later showed by Prusiner. Merz later characterized SAF as a “specific marker for the ‘unconventional’ slow virus diseases” (Merz et al. 1984), whereas Prusiner used the same visualization device to promote his ‘prion hypothesis’. For instance, ‘structuralists’, as they call themselves, questioned the use of Fourier transform infrared spectroscopy to compare the secondary structures of PrPc and PrPsc (Interview with R. Melki, 18 February 2002, Paris). See http://www.expasy.org/history.html or Appel et al. (1994). For a description of NMR see p. 22. Prusiner also used other programmes, such as MidasPlus (Molecular Display and Simulation System), which were developed by the Computer Graphics Laboratory of the University of California where Prusiner’s laboratory is located. On the Midas, see Ferrin et al. (1988). On stereo views, see Martz & Francoeur (2001). Note that only three of the four helices predicted in 1994 were modelled. Prusiner remained silent about his false prediction. The notion of chaperone molecules was introduced in the mid-1980s to denote molecules that influence proteins during their folding process. A paper was specifically devoted to the protein X hypothesis. See Kaneko et al. (1997). See also the different documents available at http://www.nobel.se. On the role of two French biologists in the development of a kinetic approach (as opposed to Anfinsen’s thermodynamical approach), see Segal (2002). On the unconscious use of metaphors, see Lakoff & Johnson (1980). This part of the paper was reproduced in Aguzzi (1997) and Raeber et al. (1998). See on another level, the “Lufthansa route model” analysed by Dressel in this volume to explain inter-species transmission. For these findings, Bloch and Purcell were awarded the Nobel Prize for physics in 1952. On Phillips, see Shulamn (2000). Wüthrich and other specialists are hoping that the recent development of solid-state NMR, first developed for short synthetic peptides, will allow them to find out the structure of aggregate proteins like PrPsc. Wüthrich published a paper in TIBS which explicitly contradicted Prusiner’s theoretical model. See Glockshuber et al. (1997). The 1996 paper was complemented by another one, Riek et al. (1997). Prusiner’s viewpoint on NMR analysis is described in Baldwin et al. (1998). See also the official homepage at http://www.mol.biol.ethz.ch/wuthrich/software/molmol/). The Journal of Molecular Graphics published by the Molecular Graphics Society first appeared in 1983, marking a turning point in the institutionalization of the field. See his two laboratories at http://www.mol.biol.ethz.ch/wuthrich/ and http://www.scripps.edu/mb/wuthrich/. (last accessed in February 2003). A study has already been devoted to E. Coli in cell differentiation of all species. See Thieffry (1996). Non-Mendelian heredity in yeast was first noticed by B.S Cox (Cox 1965; Lacroute 1971) and later by M. Aigle & F. Lacroute (Aigle and Lacroute 1975). Because yeast cells are so easy to handle, it has been possible to establish in these organisms the new protein-based mechanism of heredity specific to the prion theory. The link between non-Mendelian heredity and the prion theory has been analyzed by means of lexicography. See Maunoury et al. (1999). As Wickner explains on his homepage, “the normal function [of the URE2 protein] is to turn off utilization of poor nitrogen sources if a good nitrogen source is present.” (http://www.ncbi.nlm.nih.gov/Yeast/wickner.html). The name “Ure2” comes from ureidosuccinate because [URE3] is regarded as a non-Mendelian genetic element that makes cells able to take up ureidosuccinate when ammonia is the nitrogen source. On the relevance of the yeast model, see Couzin (2002). The resistant form analogous to PrPsc is noted Sup35[PSI+]. Whereas a P4 laboratory is necessary to experiment on mammalian prions, yeast work is done in a P3 laboratory since there are no risks of human contamination. See Chamak’s chapter in this volume on the development of French research on prions in the early 1990s. The LURE was the synchrotron at their disposal (Laboratoire pour l’Utilisation du Rayonnement Electromagnétique). On the differences between yeast and mammalian prions, see Fernandez-Bellot & Cullin (2001). Interview with Dominique Dormont, 29 November 2001, Fontenay-aux-Roses (see also Chamak’s analysis of Dormont’s work on TSEs in this volume).